falx cerebel´li the fold of dura mater separating the cerebellar hemispheres. falx ce´rebri a sickle-shaped fold of dura mater in the longitudinal fissure, which separates the two cerebral hemispheres. Short process of dura mater projecting forward from internal occipital crest below tentorium. pl. falces [L.] a sickle-shaped structure. 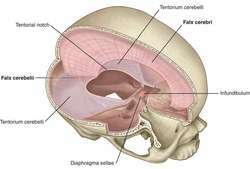 the fold of dura mater separating the cerebellar hemispheres. a sickle-shaped fold of dura mater in the longitudinal fissure, which separates the two cerebral hemispheres.